We get advice all the time. From people that we know, we respect and those we don’t know and we don’t necessarily respect….but we learn from regardless. Here is a collection of advice from a group of people from all walks of life…. May something resonate with you! 2. You get only what you settle for. 3. Be clear and transparent. 5. Don’t get caught in analysis paralysis. 6. Listening is very different from hearing. “The best piece of advice ever imparted to me comes from my mom, who is fond of saying ‘What you say matters less than what people hear and understand.’ As a teacher, she was a brilliant listener, and she used what she heard to build a bridge between what she needed to teach and how the student needed to learn. From that, she taught me to focus my efforts on helping people understand rather than on what I wanted to tell them. She taught me how to hear, and it is the single most important skill in my professional success.” –Courtney Buechert, founder and CEO of creative marketing agency Eleven, Inc.
7. Put your weirdness into your work. 9. No cohesion, no team. 10. See the spaces, not the trees. He noted that the big three—Gallo, The Wine Group and Constellation—grew 8% on a huge base of 150 million cases. “They represent in real terms almost half the industry’s growth.” The next five players—Trinchero, Bronco, Treasury, Delicato and Kendall-Jackson—represent 51 million gallons and grew at 3.5%. “They were very successful, too,” Freed noted, with Trinchero doing an outstanding job. The next players—Don Sebastiani, J. Lohr, Bogle, Charles Krug (Peter Mondavi family), Diageo’s Beaulieu and Sterling, Korbel and Fetzer—grew 1.3%. That doesn’t leave much for smaller wineries. Although the Selection and Hiring Process may seem time and step-intensive, hiring the right person for the right job is one of the most important responsibilities a company has – one that has far reaching and long lasting effects. Investing the time at the front-end of the process by selecting the right recruiting firm and carefully and thoughtfully deciding with them what functions the person must perform and the skills necessary to successfully perform those functions, will help you attract, hire and retain your human capital. A small to mid-size business invests 30%of budget dollars in humans – that is why recruiting and retention matter. When we think of our people as an investment, it begs the question, what are your expectations for the dollars spent? What do you want to see as a return on that investment? Before making that next investment, take a moment to determine what you truly need and then make your plan. Take a sufficient amount of time to outline each step by beginning with a solid recruiting and hiring process.It is important to develop a recruiting process that suits the needs of your company, one in which you are comfortable enough to use routinely. Often, when an employee leaves, it feels natural to want to replace the person and hire for the same role when, in fact, the situation presents a great opportunity for you to assess your current staff. What are your teams strengths and skills? Where are the gaps? Perhaps the position previously held was sufficient at the time, however now we have a chance to add skills that are more in-line with the company’s needs and vision. Once you have identified the skills present, you can now define the essential skills and functions needed to fill the opening. This brings us to the next step, defining the position. Capturing the essential functions, experience, knowledge, skills and abilities in a job description will provide a guide for us as we begin the quest toward filling the position. Job descriptions play a key role to not only define the position initially, it is used to craft job advertisements, to set expectations both during the interview and post-hire, support for daily coaching and, if necessary, as a document for disciplinary actions.In addition, the job description is a terrific place to begin when crafting your interview questions. Begin with the essential functions. Take each function and create behavior-based questions designed to get the candidate to describe how/when he/she performed such a function, what tasks were involved, what actions were taken and what were the overall results. Using a standard list of skill-based and behavior-based questions provides an equal assessment field for which you can evaluate candidates.Additional tools are available to assist with the decision-making piece of the equation. Consider, for a nominal amount of time and money you can incorporate reference checks, assessments and telephone screenings. These tools, although helpful, do not provide the answer; these tools provide insights and additional information for consideration along with the other critical pieces. Recruiting best practices includes taking a holistic look at all information available to make the best selection for your company’s needs. How to address "Your Overqualified"
Do Some Soul Searching and Savvy Preparation. 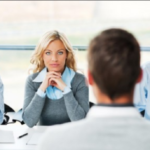 Acknowledge that employers are reluctant to hire a person who is overqualified because they think the person is unlikely to be happy, won’t stay long, might want the interviewer’s job or may expect fast promotion. Remember that you can be threatening to the interviewer, especially if you are truly suited for the interviewer’s job! He may think you aren’t seriously interested in doing the job for which you’re being hired — nor do employers want someone who’s burned out or sees the job as an easy paycheck. You may feel it, but it will work against your getting hired if you show how frantic you are to get a job. Too often an executive says, “I’ll start at any job just to get my foot in the door.” That won’t work — it’s an outdated strategy. Being willing to take any job often makes the interviewer disqualify you. She needs a competent person to perform the specific job she’s hiring for. So, you must show not only that you can do it but also that you want to do it. You can offer some advantages, gained from your experience, such as: “My ability to solve problems and train others would be a major plus in the position.” Many employers are slow to hire, yet pay well when they select someone for the position, so patience is essential. Look Harder for Positions for Which You Are Qualified. Employers want a good fit and an individual who delivers results. Customize every cover letter you write and tweak your resume to match the opportunity. Be sure to address the major needs required and demonstrate results you’ve achieved in line with the level requested. A former CEO at a smaller company might only be a midlevel executive at a larger organization, so be clear as to how you’re leveraging past experience and leadership to help a potential employer excel. Networking Is Key to Hearing About and Landing a New Job. Personal Branding is a critical component of any career. No matter what your occupation, it’s important to create a “stamp” of who you are professionally so others can identify you as a prominent thought leader or trusted expert in your industry. Your skills, personality and values all tie into your personal brand and help others — particularly, employers — know what’s important to you, what you’re good at and what you’re able to give back. Express genuine interest in their profession or industry. Great personal branders know passion is one of the most important aspects to creating a convincing and compelling professional identity. Before you even begin to brand yourself, make sure you’re focusing on something you truly love to do, or risk coming across as insincere. Know the importance of clarity and consistency. Communicating your personal brand clearly and consistently across all outlets ensures your audience knows exactly how you mark yourself. Great personal branders make this a habit so they can clearly demonstrate what they are and aren’t about. Know their values. Another key component of an effective personal brand is identifying and communicating your values. Great personal branders have already asked themselves, “What is it that’s truly important to me?” Maybe you value environmentalism, empathy, honesty, innovation, individuality, boldness or volunteering. Those with great brands know their personal values provide the foundation upon which their entire brand can be built. Identify their audience. Knowing what your audience wants from you is important to maintaining a relevant professional presence. For instance, a professional who’s branded themselves as an expert on the economy might confuse their audience if they suddenly start sending out tweets about pop culture. The best branders identify what their audience wants from them and delivers consistent, timely, and relevant information to meet those expectations. Position themselves as experts. You can’t create a great personal brand without being dedicated to learning all there is to know about your industry, and then demonstrating that knowledge. You can do this in a number of ways, like keeping a blog or creating and sharing email newsletters. No matter which outlet they choose, the best branders always work to deliver reliable and compelling information to keep their audience engaged. Keep their online presence up-to-date. Great branders know anyone can be Googling them at any time, and they know the Internet is usually the best resource for anyone who wants to know more about them and their career. Keeping social media profiles, blogs, and websites clean and updated with the latest information is a key way to ensure others can access and understand what you’re all about. Keep learning. Continuing to learn and grow is crucial to ensure your brand never falls short of expectations. The best personal branders stay on top of learning and developing their skills — and that doesn’t necessarily mean going back to school. Great branders simply seize every opportunity to try new things and advance themselves professionally and personally. Following these seven habits of effective personal branders can mean the difference between showcasing yourself as a competent and valuable employee versus someone who places no importance on their personal values and professional goals. Take these tips with you as you craft your personal brand, and others will pick up on your commitment to professional success. 1. Being in a Silicon Valley startup generally means living within a shoestring budget. You earn little or no income while working 12-hour days. It’s a life of late nights and early mornings — and occasionally no separation between the two. 2. You spend months wrestling with borrowed equipment that doesn’t do what you want it to do, and weeks trying to “kludge together” a workable solution from what you’ve got on hand. 3. You have frequent interaction with local officials, who throw every possible roadblock in your path. 4. There is a high probability of failure, and the outcome is dependent on whimsical events completely out of your control. 5. And once you get venture capital, it gets a lot worse.